For most, their favourite kinds of musicals are the funny ones. For me? My favourite kind of shows are the almost sung through operettas that exuberate classic Broadway musical theatre, and On The Twentieth Century is exactly one of those shows. It was originally produced on Broadway back in the 70s and verges on being an operetta with a score by Cy Coleman. 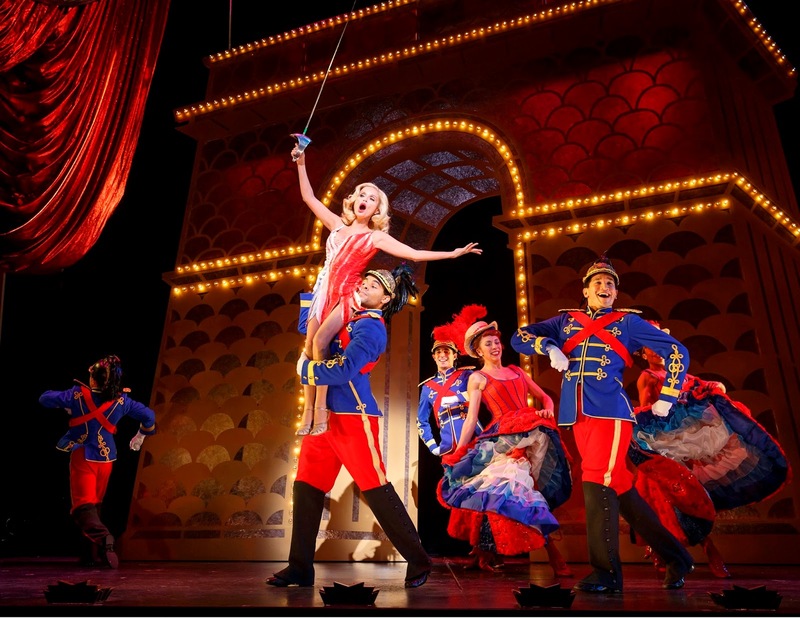 This new production for 2015 (which ends its limited run this Sunday afternoon) stars Tony Award-winning Broadway diva Kristin Chenoweth as well as Peter Gallagher, Andy Karl and Mary Louise Wilson. This show is an absolute stunner. The story follows Oscar Jaffee, a producer of the stage who has had a series of flops and is starting to fall on hard times. He decides to board the Twentieth Century train from Chicago to New York City to take a new play straight to Broadway... only problem is, he has no show and no star. Along with the help of his friends Oliver Webb and Owen O-Malley, they reunite Oscar with his old love affair Lily Garland (Chenoweth) as they reveal Garland's backstory, investigate mysterious goings on on the train and fall into a love triangle. It's a musical comedy at its best and is entertaining in every single way it possibly could be. The performances are what makes this show. Of course, Kristin Chenoweth shines in this role that almost feels like it was written for her; she is Lily Garland. Why on Earth she didn't take the Tony home last month baffles me to this day, but at least she was nominated for such an incredible performance. Gallagher also seems to embody his Oscar Jaffee perfectly, too. He has such an air about him that can let off such cockiness as well as still feeling relatable and loveable from an audience's perspective which I find very clever. Andy Karl has a similar feel about him and manages to bring some physical tricks I'm sure he learned when he led Rocky on Broadway last season to this classic show. As for everyone else in the cast: they blend in together so perfectly and give this show its classic Broadway feel. The Porters are especially mesmerising as they execute both complicated clashes in their vocal harmonies and extremely demanding and well-choreographed tap (by Warren Carlyle). It's marvelous. As for the rest of the production value, the show is a stunner. There is a proper train on the stage at the start of the show that opens up to become the staging for the rest of the show as the cast run around the train and in and out of it: some of the best set I've ever seen! This gorgeous set mixed with the A** talented cast alongside the beautiful score? This show is one of the best things I've ever gotten to see. Personal favourites from the score are Veronique (that video linked for Veronique is actually the entire performance of Kristin's which I highly recommend watching), Never and Babette (both of these videos are shorter clips of Chenoweth performing). Chenoweth told Elaine Paige in an interview recently that they want to bring this production and that she refuses to leave the show's side. I truly hope this happens. Not only would it be gorgeous to see this show again in all its glory, it would be an added bonus to see Kristin reprise this role. All aboard!